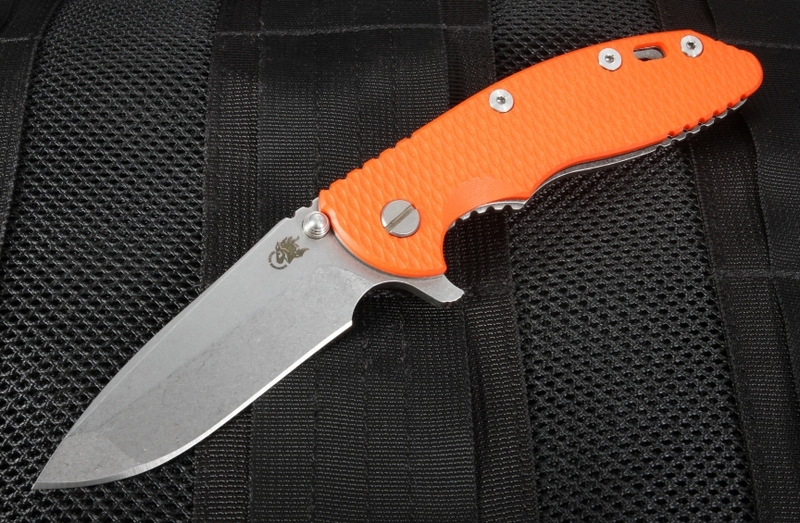 This rescue orange 3.5-inch XM-18 Spanto flipper from Hinderer Knives is the fourth generation of their iconic folding knife. This orange color is a top choice for hunters, coast guard and rescue personnel who need high performance and high visibility for dangerous operations. Each Hinderer 3.5" Spanto knife is made in America by Rick Hinderer Knives of Shreve, Ohio. 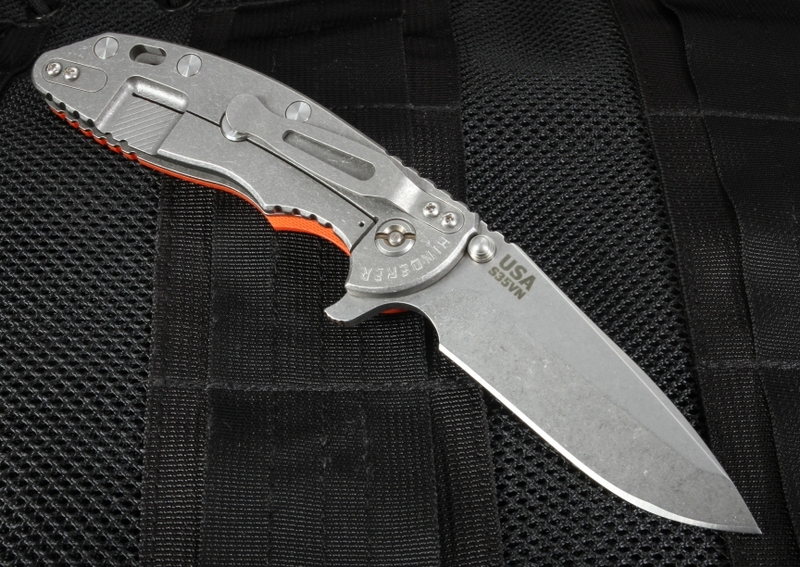 The 3.5-inch blade on the Rick Hinderer XM-18 is American-made CPM-S35VN steel. This fine-grain stainless steel has superior corrosion resistance and edge retention. The Rick Hinderer Spanto grind is probably his most well-known blade shape, combining the spearpoint and the Tanto for great slicing and piercing. The integral flipper and double thumb studs offer easy opening options with either hand. Jimping on the thumb rest of the handle and blade spine provides excellent grip. The Spanto XM-18 has a handle made from extremely high quality titanium and textured G-10 composite that are light and responsive. Handle features a frame lock design with a Hinderer lock bar stabilizer to keep the knife open when needed. 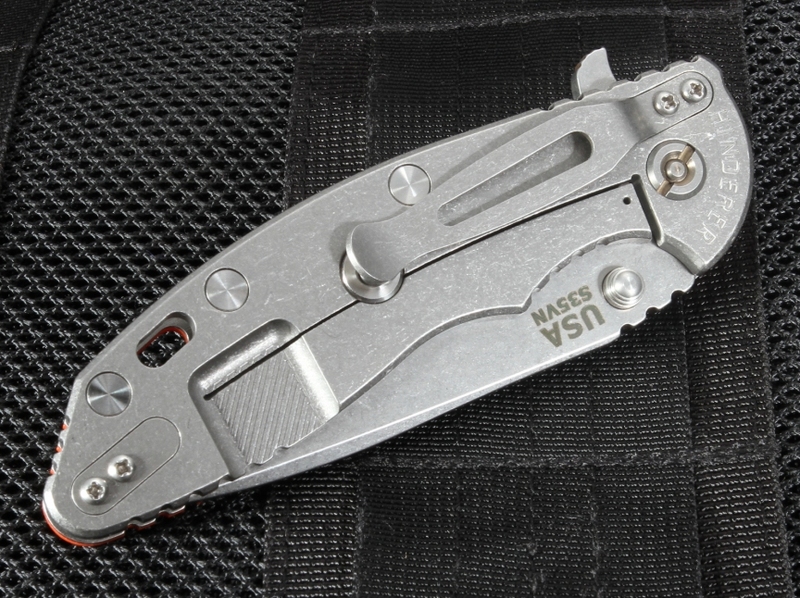 A lanyard hole is in the rear section of the handle for neck carrying or to quickly pull the knife out of your pocket. The titanium pocket clip can be mounted for tip up or down carry. KnifeArt.com has a 100 percent satisfaction guarantee on this first responder knife. All Rick Hinderer knives have a lifetime manufacturer's warranty on craftsmanship and materials. We offer fast delivery and expert customer service on the Rick Hinder XM-18 3.5" Spanto and other fine knives. I have purchased a couple of the Hinderer designed Zero Tolerance knives including the 0560 and the 0566. The 0560 by ZT is by far my favorite of the bunch. You just can't beat the smoothness of the ball bearing action and the Elmax steel is fantastic for sharpening and holding an edge for a lot of heavy cutting tasks. Problem is the 0560 is just a little too big for an EDC. The 0566 is a great knife in design (also Hinderer) but the assisted opening almost always generates comments from people thinking I carry a switch blade and traveling between states, I just am not sure on the knife laws. Also, there is just a little problem with the fit of the blade and frame lock. Nothing big, but annoying that it gets really jammed up when cutting hard. However this is a review of the XM-18 and not the others. The point is, as impressed as I was with the Hinderer designed knives manufactured by someone else, I really wanted to have a true Hinderer knife. The XM-18 is a great size and weight. Although if it was any longer or heaver, it would be too much. Out of the box, the action was stiff, which can be attributed to new manufacturing. It is loosening up with working it and oil. The factory edge is the WORST I have ever had from a new knife. However, it did sharpen up pretty well adn seems to be holding it's edge (new - haven't used it much to test it yet). In short - I am liking the knife, but REALLY questioning the price tag. The ZT flavors are equal in almost every way and at half the cost. Caught up in the hype, I'm thinking the Hinderer design is great, but their manufactured knife is just not worth the price. This knife is absolutely awesome, great fit and finish, lock up is perfect, detent is really good also, i heard that older models have very weak detent, this is not the case with the Gen 4's. Also, Knifeart.com has excellent shipping, i ordered it and received it the very next day, this is coming from Arizona to Ontario Canada, couldn't believe how fast it came. I couldn't be happier with this purchase, i will definitely be buying more from them.